Most brands are interested in gaining exposure, and choose to measure impressions — the number of times a consumer sees a post. That’s one of our metrics. But we also track engagement (likes and comments on posts, divided by follower count) and other, more involved numbers. 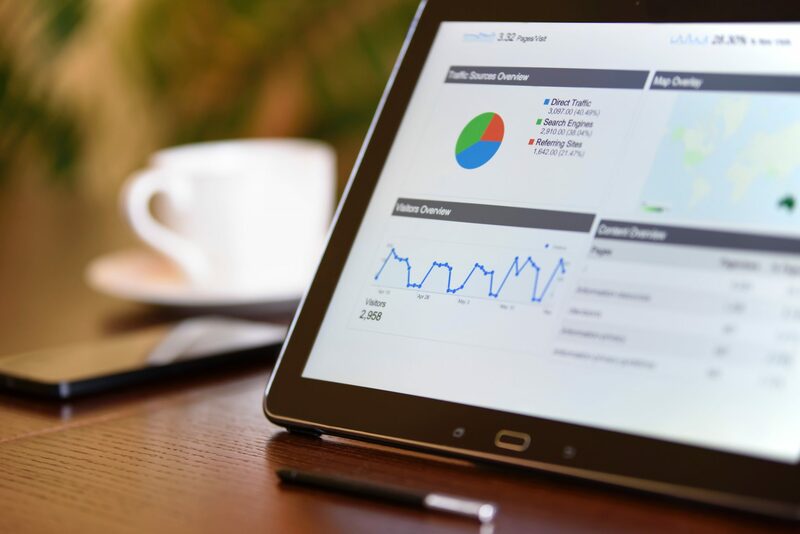 Moving forward, there are more advanced ways of measuring your return on investment with influencer marketing. 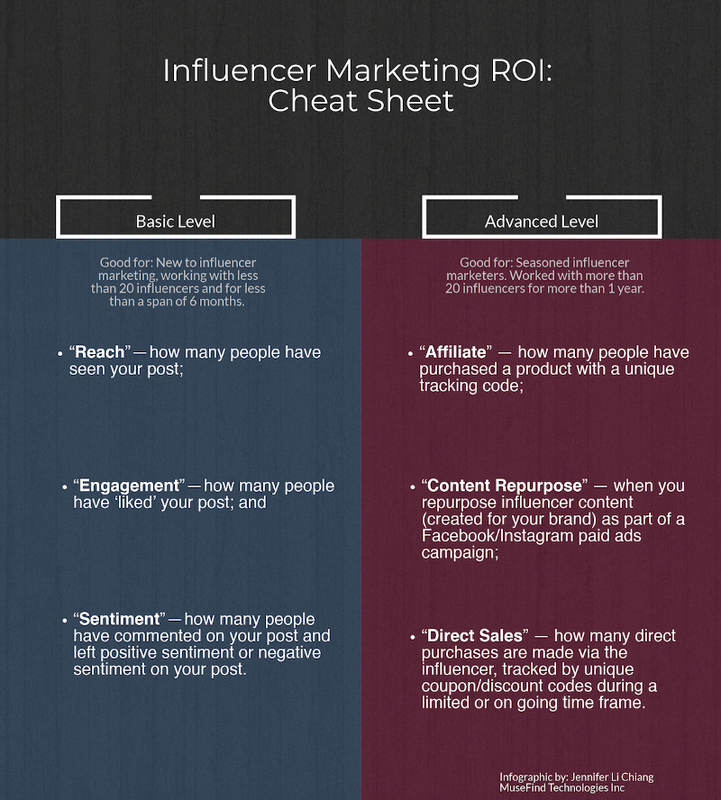 Our introductory to what is an influencer and how to measure ROI. On Instagram, calculating reach is difficult as not all people who follow the influencer will see every single piece of content. With platforms like Instagram, we recommend to focus on engagement (below). # of engaged users (Likes + Comments) ÷ total #of followers x 100 = % rate. An average influencer will have an engagement rate of 1–4%. “Sentiment” — how many people have commented on your post and left positive sentiment or negative sentiment on your post. You can analyze sentiment based on comments followers of the influencers leave, you can see if they are generic, fake, positive or negative. Be wary of negative comments/sentiment as some of these bots can target any influencer and leave these comments. Read how to spot fake influencers. 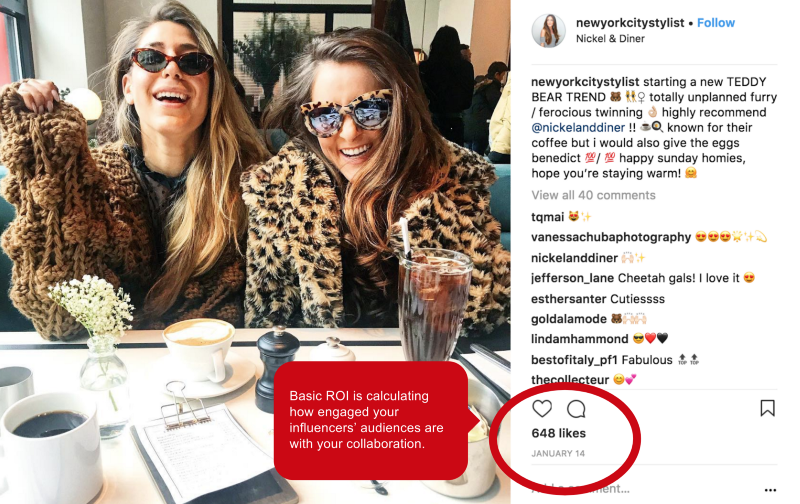 Seen as a more passive version of using direct sales with influencers, measuring your ROI through affiliate sales means that the influencer has a passive mention link of your product/e-commerce page in their post. If one of their followers clicks though and makes a purchase, the influencer will cash in a small fee. This is often less than a direct sales approach which gives the customers a larger discount for a limited time or event and the influencer will receive a larger cut of the sale. 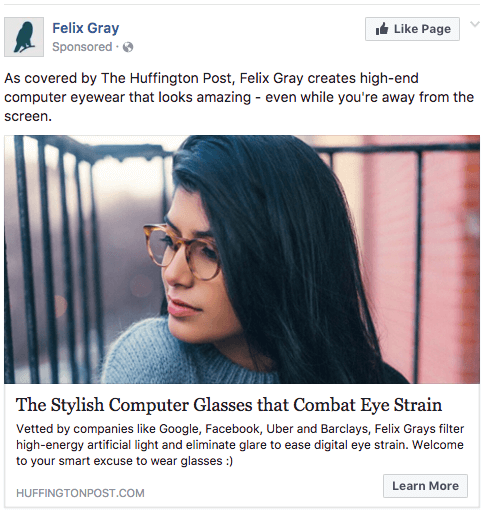 Felix Gray used this top performing influencer content from a campaign in a direct Facebook/Instagram paid advertisement campaign. Influencers create beautiful content: video, images, gifs…the creative possibilities are truly endless. 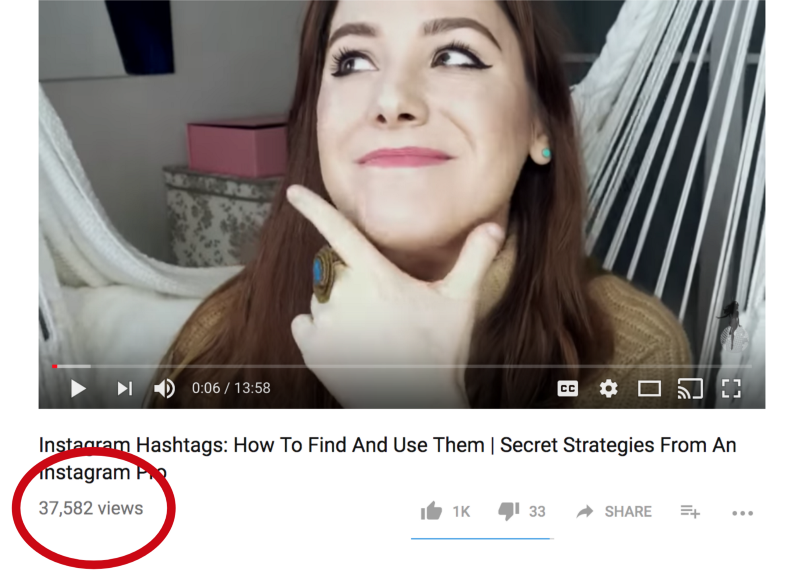 This is where influencer marketing is set to soar. Brands like Felix Gray saw the power of influencer marketing content and took the top performing influencers content and launched them into a Facebook/Instagram ads. This further reinforces their influencer marketing loop and when paired with affiliate, delivers powerful results. “Direct Sales” — how many direct purchases are made via the influencer, tracked by unique coupon/discount codes during a limited or on going time frame. Example of “omgitsyeshi” as an affiliate code. 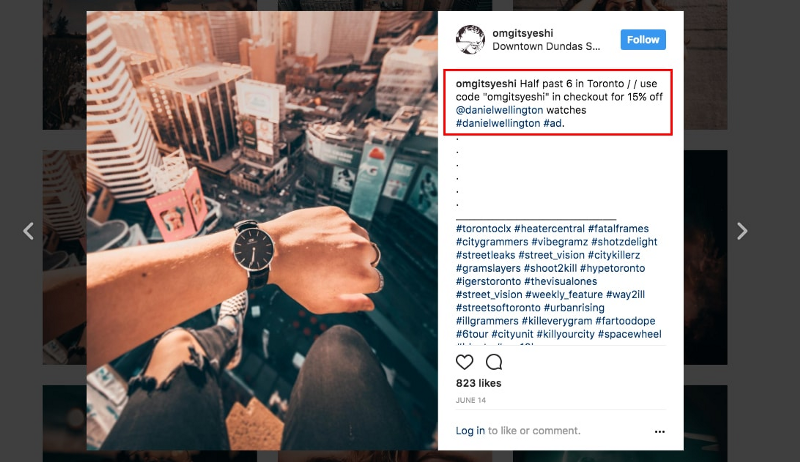 Daniel Wellington is known as a pioneer in the early days of utilizing influencer marketing by using coupon codes. He had already an ambassador program of 100,000 influencers across the world by the year 2016 and that scale and experience allowed his program to be more successful. Jennifer is an early pioneer in influencer marketing. She has grown ambassador and influencer programs from the ground up and has worked with YouTuber Michelle Phan and Lady Gaga. 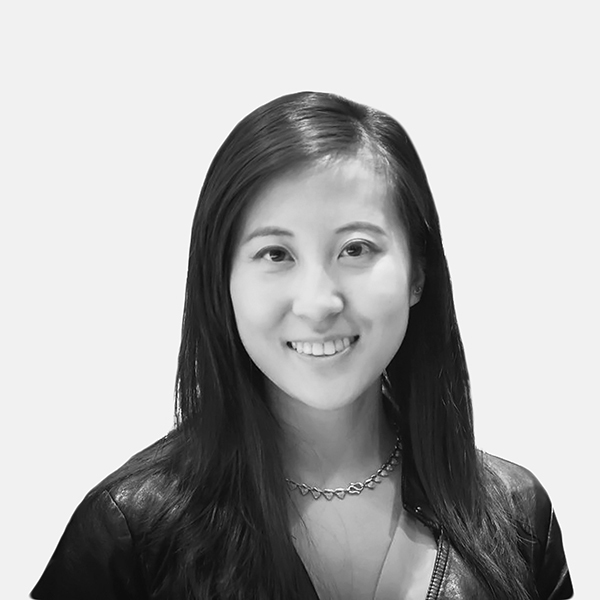 She is a former veteran in the Canadian Armed Forces (Army Res) for over 10 years and has led MuseFind into being the only Canadian company to receive funding from a New York City accelerator. Jennifer has spoken on the stages as a thought leader in influencer marketing at Social Media Week NYC, NRF Microsoft, Havas Luxe and more. Jennifer will be joining us on March 27 to discuss using key leaders in your market to drive your brand, connecting with your target audience in a unique and authentic way, how to tie it all into increased traffic, conversions and revenue and more in this highly requested breakfast talk.